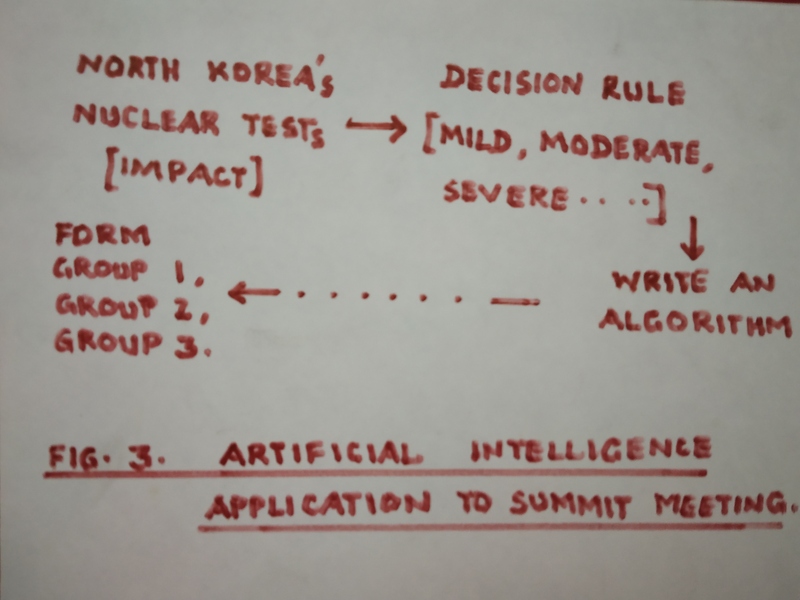 ” Donald Trump – Kim Jong Un Summit Meeting in Vietnam – Expect the Unexpected ” – February 28, 2019. The Second Summit Meeting between President Donald Trump and Chairman Kim Jong Un ended prematurely without any signed or agreed upon declaration, with the Working Lunch prior to that cancelled sans any compensation. All hopes with complete belief in the possibility of fulfilling at least a part of the ‘denuclearisation’ deal remains demolished. What was widely expected to be declared as a new era of relationship between the two nations, the U.S.A. and North Korea ; what was widely expected to be declared as the proudest achievement of President Donald Trump ; what was widely expected to be declared as a relationship capable of moulding the future peace in the world – has finally turned out to be oneiric raising the levels of uncertainty while making the task of North Korea’s Denuclearization a humongous task to anyone and everyone hoping for a breakthrough. That the foundation for the relationship laid down in Singapore could not be taken forward a bit is the disappointment. The only silver lining that can be expressed with some face saving grace lay in Chairman Kim Jong Un’s statements during the discussions earlier (before the abrupt end of the meeting was announced) : (a) I welcome the idea of a U.S. office in Pyongyong ; and (b) I would not be here if I am not willing to discuss denuclearization. President Donald Trump addressing the media in Vietnam. 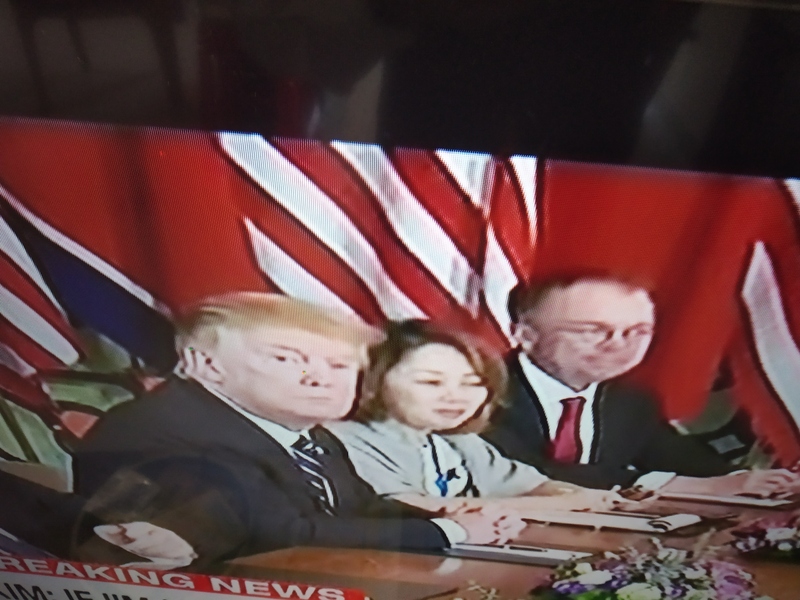 President Donald Trump in his address to the media after the abrupt end of the meeting called it ‘a productive time’ while adding that “this is not the time to sign anything with Kim”. Secretary of State, Mike Pompeo said : ” A big step forward with progress made and to be made in days, weeks, months ahead”. “Kim Jong Un wanted all sanctions lifted and we couldn’t agree, hence, we walked away”, said President Donald Trump. Figure 4 deals with the ” Social Perception” of the tests. In conclusion, it may be stated that the two leaders did not signal any positive change in attitude at the end of the meeting ; any normalisation and future discussions or relationships is as unpredictable as the leaders themselves are known to be given the frequent internal and external uncertainties that shroud the Summit itself ; respect for morals, compassion, and peace need to be assigned the highest order of priority. 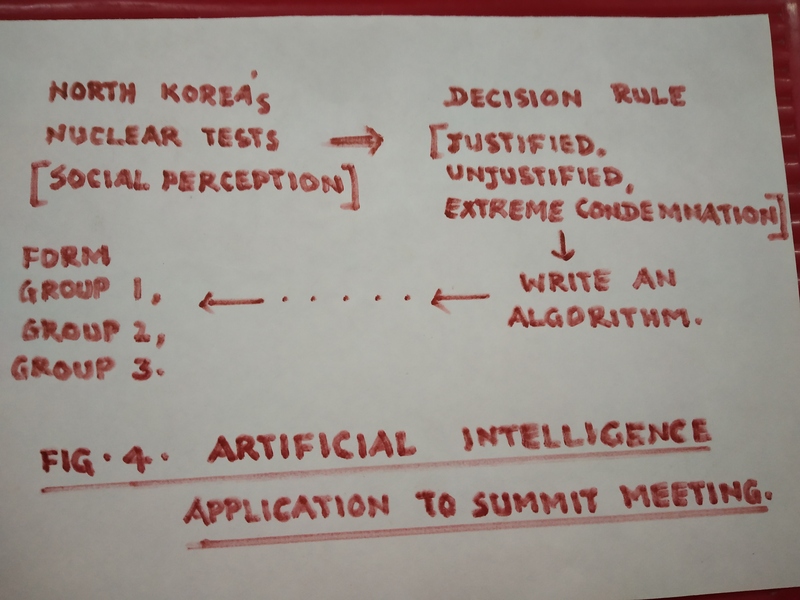 That will only constitute a great Summit Meeting enabling a real outcome. Thursday, February 28, 2019 – 2.39 p.m. (IST). Tidbit : ” A man, however fallen, who loves his home is not wholly lost ” – Benjamin Disraeli. ” Donald Trump – Kim Jong Un Summit Meeting in Vietnam – 27,28, February 2019. Smiles, handshakes, and pleasant exchanges will sure dominate the Second Summit Meeting between U.S. President, Donald Trump, and Chairman, Kim Jong Un, DPRK, in Hanoi, Vietnam. 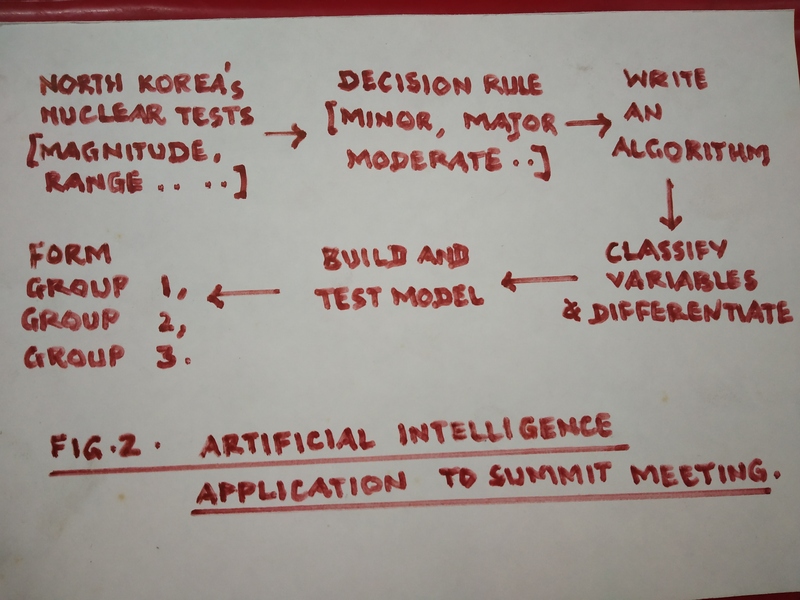 While the Diplomacy last time in Singapore took just 4 months (from Feb 2018 to June 2018) to get real, this time it is even faster with no uncertainties about cancellation and revival. But common folks like me didn’t see anything concrete happening after the Singapore Summit. 1. Mission : World Peace. 2. Goal : Peace, Security, Nuclear Disarmament, Economic growth, and Modernisation. 3. 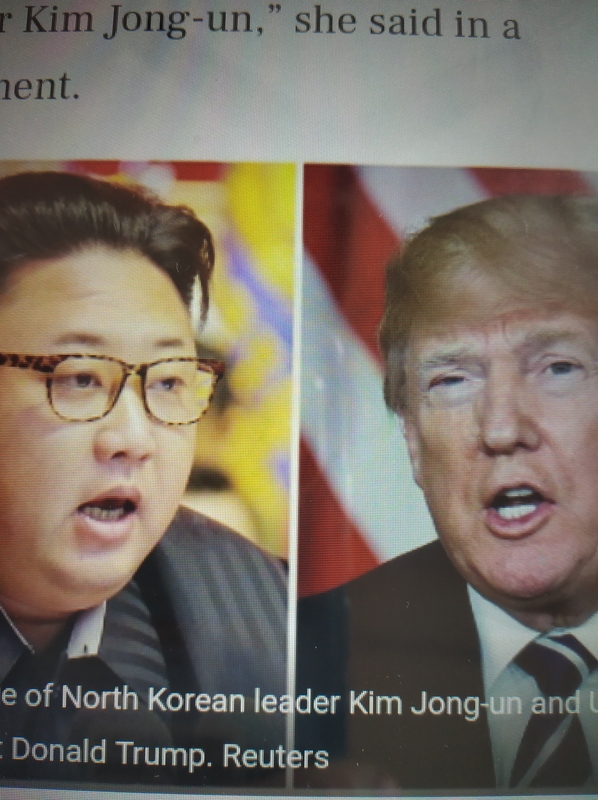 Objectives : For Donald Trump these lie in Complete abandonment of North Korea’s nuclear program (CVID); For Kim Jong Un these lie in parity with big nations; North Korea’s economic growth; North Korea’s modernisation. 4. Policies : For President Donald Trump it is “Safe America, Safe North Korea, and Safe World”. For Chairman Kim Jong Un it is “Safe North Korea; Safety of his/self rule; and Safety of his people”. 5. Program : Meet with each other possibly followed by meetings between delegations of U.S.A. and North Korea. 6. 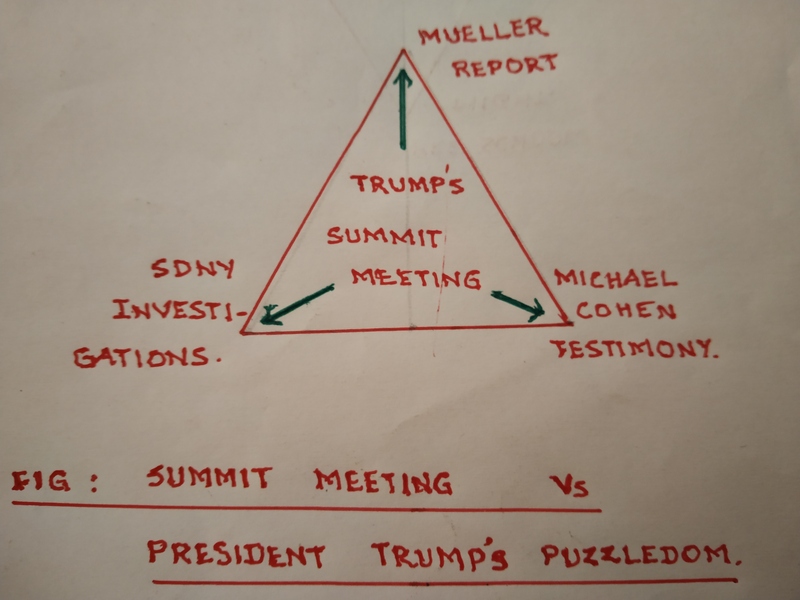 Direction : Clear understanding of each party’s terms ; Taking friendship/relationship to the next level ; Continuing Peace discussion and strategies ; Formulating action plans with specific timelines ; Exchanging information ; and Making them transparent. 7. 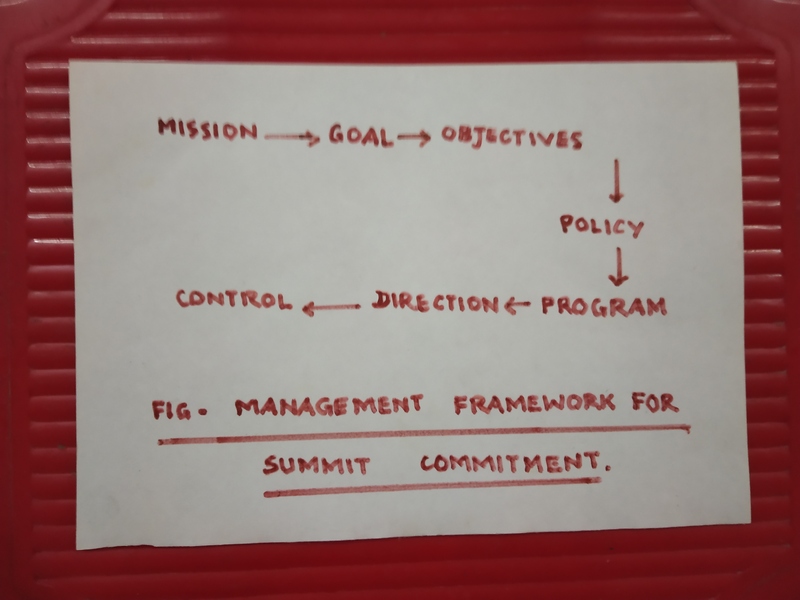 Control : A team to oversee progress on actions from both the nation’s ; Identify any significant role to any close partner(s) with a stake on this Summit outcome ; Garner enough support from other countries of the world for the action plan(s) conceived in the Summit Meeting. A commitment to the denuclearization from North Korea in exchange for Safety and Security of Kim Jong Un’s regime is the larger expectation. 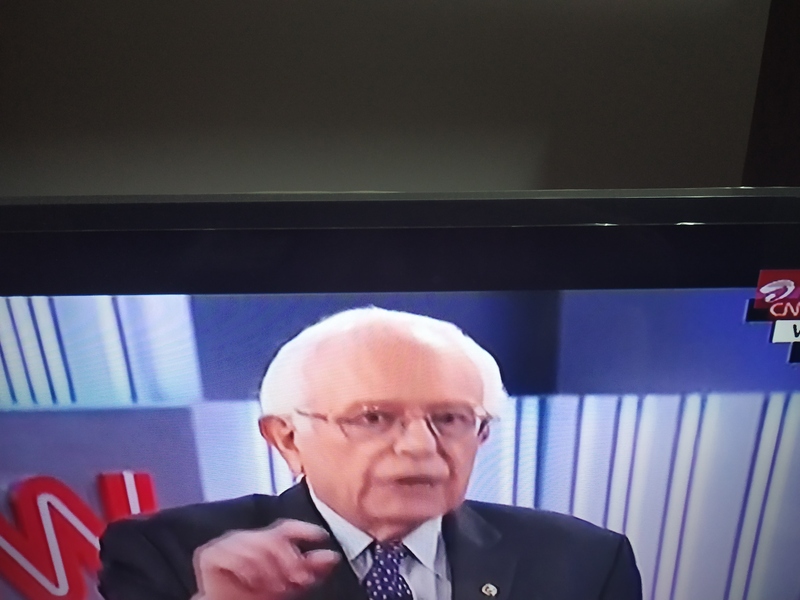 ” CNN Town Hall with Sen Bernie Sanders – ‘Truth, Trust, and Transformation are pillars of Democracy’ ” – February 25, 2019. 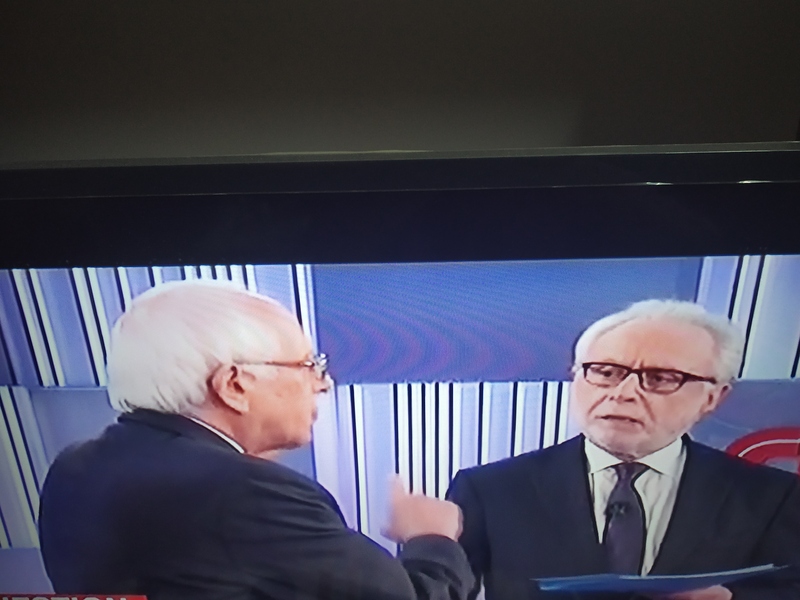 CNN Town Hall with Bernie Sanders – Wolf Blitzer is moderator.
. Tonight’s CNN Town Hall witnessed a relatively quiet, toned down, and to an extent passive Senator Bernie Sanders compared to the forcible, expressive, emphatic, and authoritative attention thrusting displayed by him on January 9, 2017, CNN Town Hall with words to the effect : ” It’ll be constructive, constructive, constructive, and never obstruct, obstruct, obstruct – ideas that make sense will witness a sense of unity; while ideas that are not in favour of community in any field ( education, health, energy, environment …) will find no compromise “. 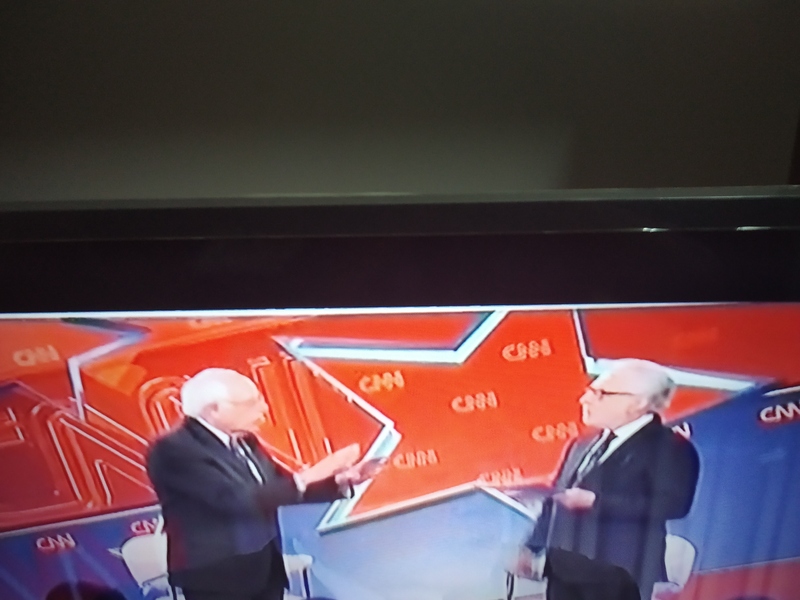 Tonight Bernie Sanders, nevertheless, was clear, engaging, and very transparent in his answers to the questions from the audience. ” DNC has come a long way from what it was in 2016 and I am confident that they’ll have the right perspective ” – Bernie Sanders’ reason for contesting as a Democratic nominee this time. If I am elected we’ll have Healthcare as a right, we’ll have minimum wage, we’ll promote a policy of a healthy and happy planet where all Americans can live – whether Donald Trump likes it or not : he asserted. This received a big laughter in applause from the audience. 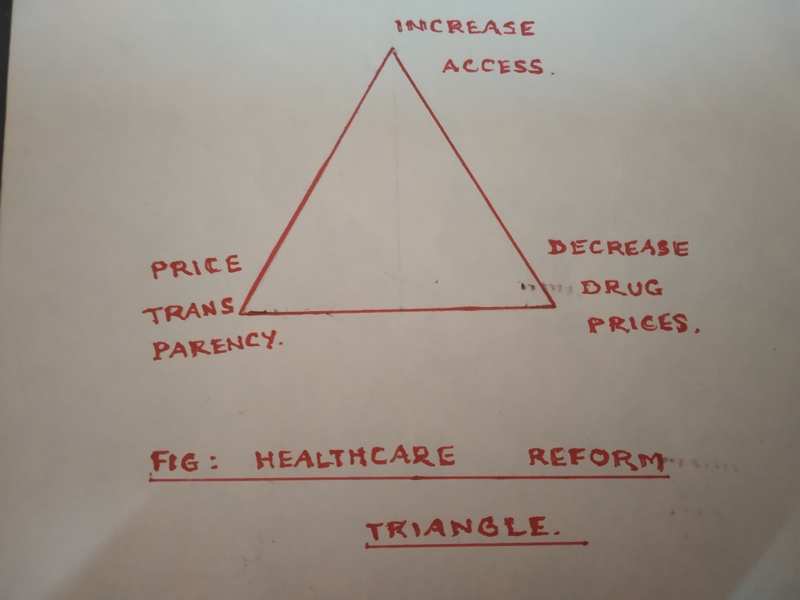 Painting the big Pharma’s greed as the main obstacle in HealthCare for All’s successful implementation, Senator Bernie Sanders identified that ‘negotiating prices’ of drugs coupled with strong ‘people support’ can make light the problems in making the program a great success. America does not guarantee all people with HealthCare now ; 30 million not covered ; spends twice as much per Capita on Healthcare than any other country. Medicare for All – Single Payer Program with an introduction of Medicare Card is the only solution according to Bernie Sanders. Tax on Wall Street speculation is from where money will come, he added. 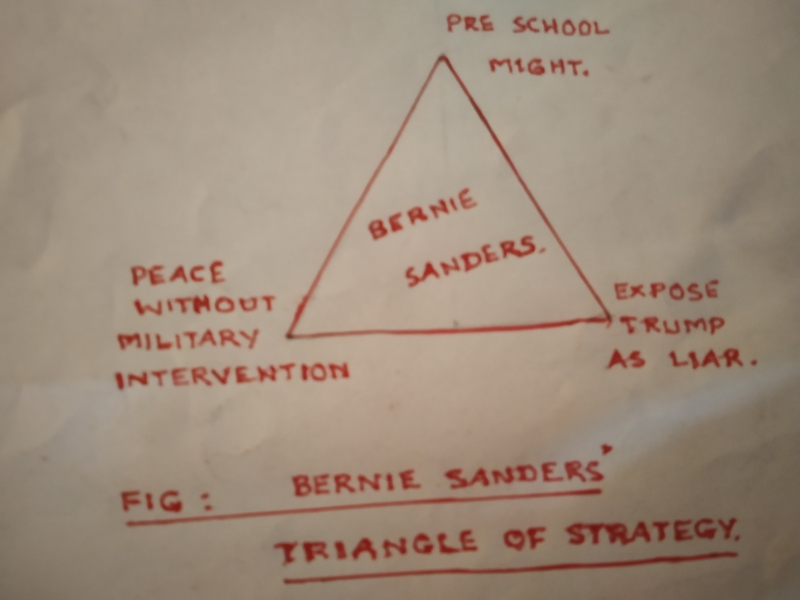 High quality, optional, publicly funded “Pre School” for all Americans with every dollar invested giving many, many more time returns causing less dropouts is where America’s future lies – he averred. America can do it. Expose Donald Trump as a pathological liar and hold him accountable for what he said and promised. Distinguishing between Humanitarian and Military efforts to bring peace internationally, he supported Democratic changes in countries but without military intervention, be it Saudi Arabia, or Venezuela. Cyber war interfering with American election will not be taken lightly. Nuclear weapons in the hands of a brutal and irresponsible powers is not acceptable, referring to North Korea. He sees Trump – Kim Jong Un meeting as a good idea. I’ll like if President Donald Trump can get Nuclear things out of the hands of Kim Jong Un. It’ll be good. Getting Iran and Saudi Arabia together, getting Palestine and Israel together – good ideas, I welcome. To the last question why he thinks himself the best qualified to beat Donald Trump he said : ” Bring all under one agenda; Guarantee Healthcare; Ensure high quality education; Protect minimum wage; Provide safety to all – policies that will resonate in many states Donald Trump won last time. He can only give effect to that “. Bernie Sanders stands ‘firm’ in adherence to promises is the conclusion that can be reached from the proceedings of this Town Hall. Tidbit : ” Working people no more on Trump’s side now ” – Bernie Sanders. 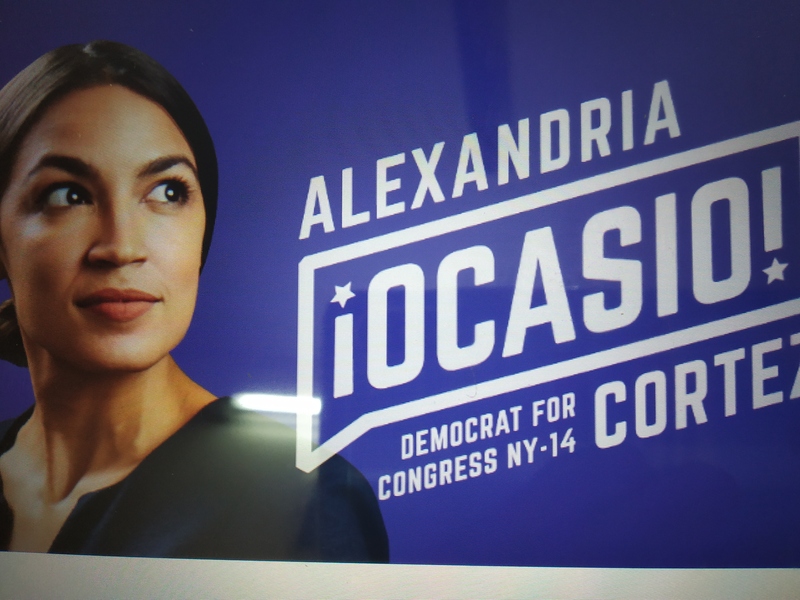 ” Is Alexandria Ocasio-Cortez a Trendsetter in Modern Politics or a Pander to the hoi polloi ” – February 23, 2019. Republicans see a refulgent glow on a resolution to be voted next week, with prospects of division in the Democratic party and unison in their own party for the good of the great 2020 contest. That the Green New Deal may be one of the key issues at stake in the upcoming 2020 Presidential election having a striking impact on the voting pattern cannot be dismissed easily. If Democrats pick the right side holding the votes for this deal, they can even be outstanding winners. Whether the Green New Deal can match the impact of ‘immigration’ as the key issue in 2016 election which catapulted Donald Trump to the Presidency is, however, in doubt. Green New Deal or Climate Change Plan is now construed as being Alexandria Ocasio-Cortez’s baby who seems to be trying to pick the groups that would vote with this deal even while quite a few Democrats themselves feel that she is erring on the wrong side. On the other hand, if she inspires her party functionaries and supporters to strive for effecting the deal in a realistic manner, rather than making this a case of Columbus starting out not knowing where he was going, where he found himself in, and where he had been in the end – all at other people’s money, she would have done a great favor to the party. Green New Deal speaks of : (a) Upgrading and rebuilding every building in the U.S.A. to conform to energy efficiency standards ; (b) Put the lid on traditional forms of energy in 10 years; (c) Decommission nuclear plants in 10 years ; (d) Put an end to air travel by building high speed trains across oceans ; (e) Plant trees rather than investing in carbon capture and storage ; (f) Unionize all new jobs ; and (g) Make carbon tax and cap and trade as a tiny part of Green New Deal plan . No specifics on how and where the money will come from except that it will be paid as in earlier instances – ‘New Deal’; ‘World War II’; ‘Bank bailouts’; ‘Tax cuts for the Rich’; ‘Decades of war’ … A pie in the sky deal. Alexandria Ocasio-Cortez’s proposal has received more criticism than support. While embracing the enthusiasm of members for the ownership of the concept, House Speaker, Nancy Pelosi, nevertheless, dubbed that as “Green Dream”. Alexandria Ocasio Cortez in reply said : ‘It’s a great dream, and that she does not consider the reaction as ‘dismissive’. ” Not gonna happen folks “, was President Donald Trump’s response to the Green New Deal. Howard Schultz, former CEO, Starbucks, contemplating a Presidential run in 2020, called it “unrealistic”. He was, specially, critical of the proposal to give ‘ a job to everyone ‘ ( it is impossible ); and reconstructing all buildings in America ( about 2000 to 3000 buildings everyday, again impossible or extremely difficult ) . Criticism seems to be justified on many counts. Chief among them is that many of her ideas seem out of touch with reality in terms of implementation over the period cited. Alexandria Ocasio Cortez is, however, confident that balancing Climate Change and Economic Inequality in a way that will protect the environment while preserving and promoting job opportunities is the right path forward for U.S.A.’s progress and growth. Will the Green New Deal give the Democrats a vital plank to fight the elections in 2020 ? Many doubt that. Is this Alexandria Ocasio-Cortez’s chief aim ‘to attain the peak of popularity’ on this issue or will she get to touch the pique only ? At this juncture, to me, it appears that she is caught in her own trap. Wait to see what the senate voting says. Tidbit : ” Getting rid of emissions from cows and all airplane travel is an inherent element of the Green New Deal “. – Alexandria Ocasio-Cortez ( Congresswoman, D-NY ). 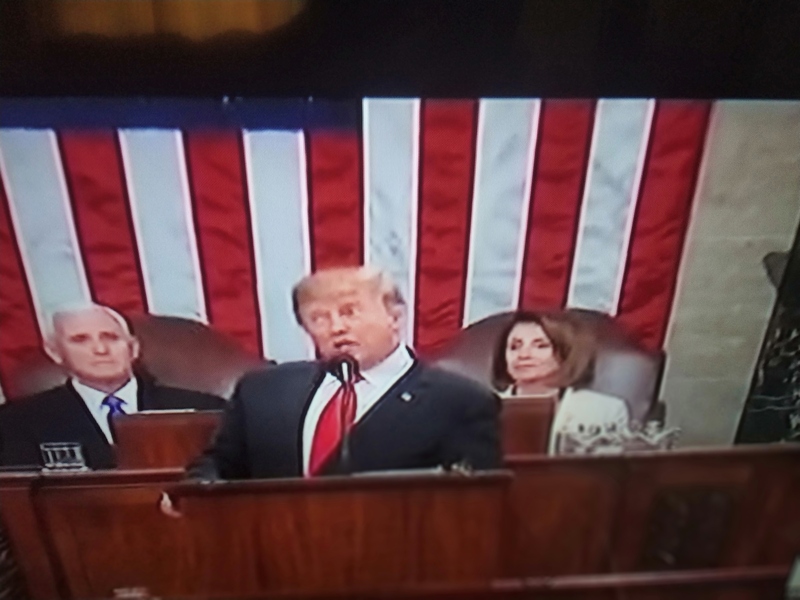 ” President Donald Trump’s State of the Union Address – ‘ L’union fait la force ‘ ” – February 5, 2019. President Donald Trump delivered his second State of Union Address on Tuesday, February 5, 2019. Basically, it is information to Congress and people on ” how the President complies with Constitution’s order from time to time ; he reports on the State of the Union ; and makes necessary and expedient recommendations “. 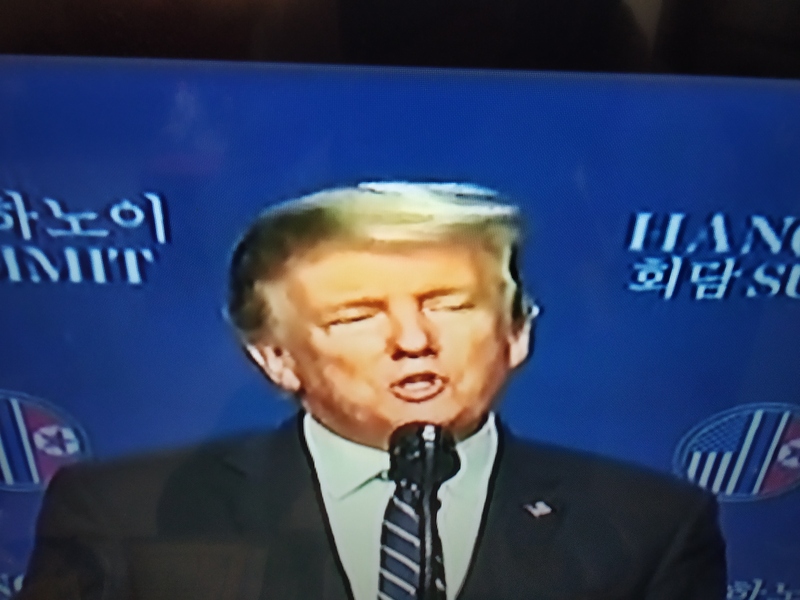 A highly coherent, substantive, real, essential, existential, and meaningful speech with key elements of ‘economy, immigration, healthcare – fight against HIV and childhood cancer -, criminal justice reform , job growth, unemployment, tax reforms, trade policies, foreign policy, Iran Iraq, Syria, Afghanistan ; including his proposed meet with the North Korean leader, Kim Kong Un , on February 27-28, in Vietnam. 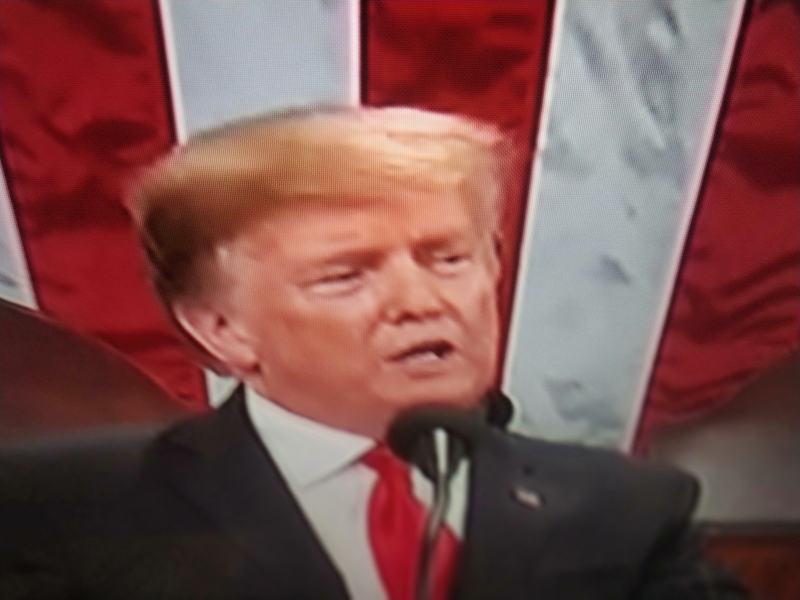 His voice sombre, words firm, messages clear, gestures perfect, issues paramount, arguments appealing – President Donald Trump’s speech is a welcome change. Rejecting the pitches of revenge, resistance, and retribution he sought compromise and common good as the essence of cooperation in solving the nation’s problems. Asserting that an economic miracle is taking place in America only to be stopped by ” ridiculous partisan investigations ” he gave his call for ‘choosing greatness’ . One is reminded of President Richard Nixon’s 1974 address when he said : ” I believe the time has come to bring the Watergate investigation and other investigations to an end. One year of that is enough “. “There cannot be war and investigations when we want peace. This is a new era of cooperation. 300 highly qualified nominees stuck in the Senate waiting for years. It is unfair to nominees and the country. Now is the time for bipartisan cooperation. We need to work together to solve the problems ” – the President averred. 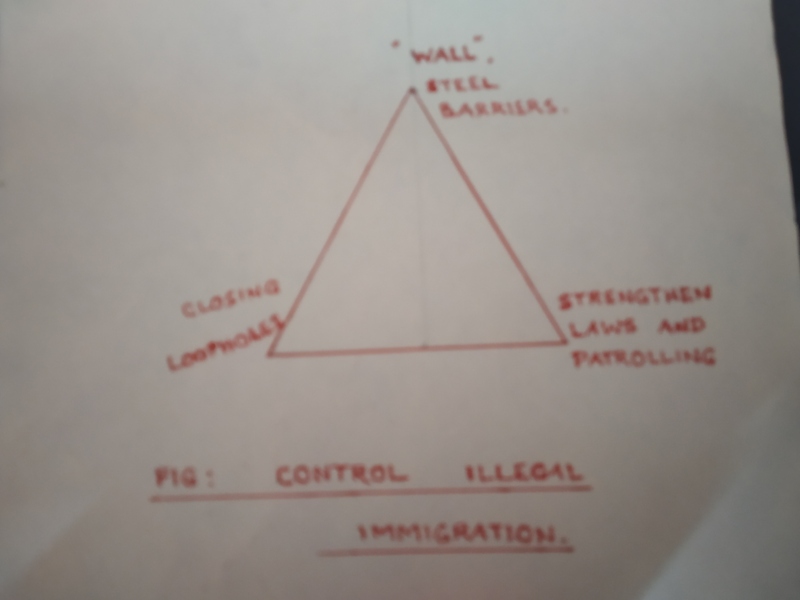 Immigration control : The figure below represents the immigration control triangle . Tolerance for illegal immigration is not compassionate but very cruel. Citing the areas of San Diego in California, and El Paso in Texas as the safest places as opposed to their being the most dangerous cities earlier – before construction of a wall – he drew attention to the conviction he holds about ‘wall’ stopping the potential illegal immigration. “Where walls go up illegal crossings go way, way, down. Not one life should be lost because our nation failed to control our border”. He also added, ” proper wall never got built, I’ll get it built”. Closing loopholes, and strengthening manpower for enforcing laws and patrolling are his other lines of safeguarding the border. 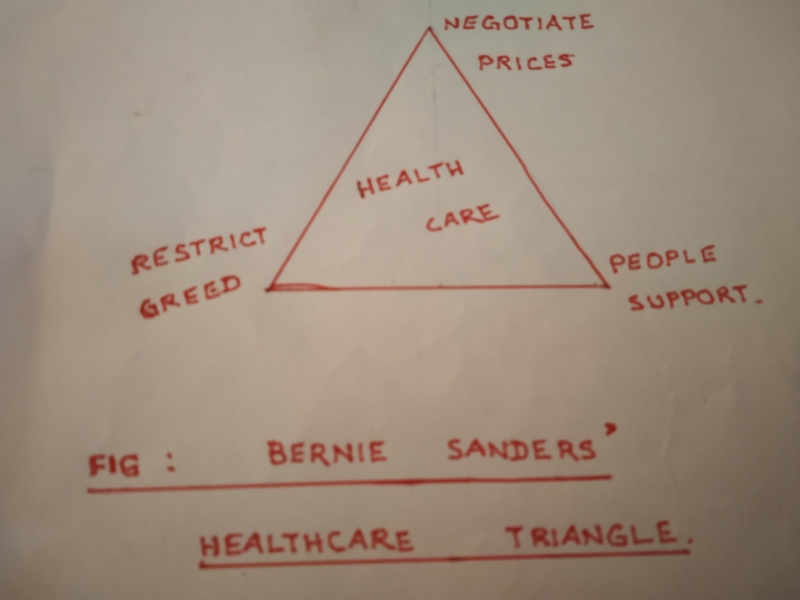 Healthcare : The figure below represents his plan for healthcare. While recounting his effort to eliminate Obamacare individual mandate penalty, he advanced his threefold measures of decreased drug prices, price transparency, and increased access to healthcare as critical to affordable health program. 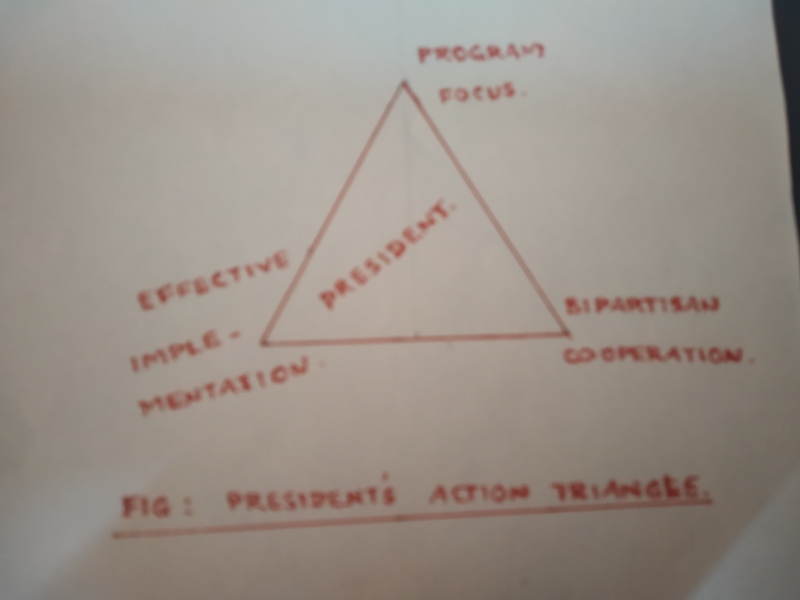 President’s action triangle : The figure below represents his action plan. Program focus refers to all the programs that he spoke about in his speech. Bipartisan cooperation refers to the conciliatory efforts of support from the whole Congress. Effective implementation refers to the concerted efforts by the Congress, by the various departments, and by the personnel engaged in delivering services to people. “America is founded on liberty and freedom and not on big government efforts alone. We will reinvigorate our resolve that America will never be a socialist country.” – he emphasized. President Donald Trump seems inclined to greater action but certainly not differences. President Donald Trump’s opponents have gained their grip, specially, after the mid term Elections. Connecting with them emotionally is the new challenge to the President in governance now. President Donald Trump’s main “product” is the ‘wall’, but the market for it – acushla to many, bête noire to others – is unwelcome now. When this happens, things turn more difficult with all his other ideas/actions. This is what is becoming visible now. President Donald Trump faces an intimidating political environment, with all his personal setbacks and governance challenges. Under the conditions mistakes can be in millions for even the greatest of all strategists. Caution is the watchword. President Donald Trump wants to bring a change in the culture of work. For it to be effective greater than 60 % should go into making a strong imprint, understanding, and support of a majority of people for all his programs. This is what effective communication of his intent and plans are all about. His intents were clear in the speech. We’ll have to wait to see the real change. President Donald Trump needs an “auxiliary champion” who can complement his stature as the ‘ ceremonious and unconventional champion’ . This will add strength and virtue. Can he identify one ? Possible, but without guarantee at this juncture. President Donald Trump’s setback, if any, at this stage cannot be construed as a sign of the government moving backwards as many would wish. It, nevertheless, reflects the possibilities of ensuing conflicts in policies amplifying the challenges greater than before in future. President has his task cut out clearly. That is to keep the parties balanced happily affording the carrots in more cases and be unyielding in other cases. Plain commonsense and obvious, one may regard. If this is not anything new, what is happening and what one may wish or say, will also be as old as hills. Tidbit : ” Walls work, walls save lives ” – President Donald Trump.